Cons: I only wish it was bigger! 32" at this 1440p resolution would be ideal. Pros: Amazing color right out of the box.Excellent stand, fully adjustable height, tilt and rotation, very solid feel to it, screen is not wobbly like the cheaper tilt only ones.Huge amount of screen space, excellent for any kind of editing / productivity software.Gaming at this resolution is super crisp, low input lag for this quality of IPS panel.No dead pixels and no backlight bleed at all. Pros: Lightweight, vibrant, beautiful, very not awful. If you're going 1440p, you'd be hard pressed to find something better for this price. I ordered two of these monitors for my workstation at the office, and I liked them so much that I ordered a few more for home. 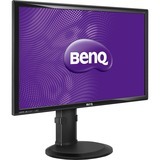 BenQ has created a fantastic monitor for the $430-470 range, and it is really hard to think of any noteworthy negatives.The monitor is well-calibrated from the get-go, and it is exceptionally bright and sharp. I had purchased off-grade Korean panels before (QNIX Evo2 and QNIX DP-multi 10), but considering the state of the CAD, I was inclined to try out purchasing some A+ panels from North American vendors this time around; I am very happy with that decision! I don't play many video games any more, but these panels don't appear to have any unreasonable ghosting or input lag. On the gaming front, the image quality is so far beyond what you can get out of a TN panel that it really does make games look brilliant. The image quality far exceeds the QNIX PLS panels I have, and it certainly leaves the Apple IPS (2014 iMac and external 27" panels) I've used in the dust. Pros: -Amazing Colour-No ghosting-Wide assortment of input options-Great pixel density + resolution-Full control over aspect-ratio and black-barring for odd resolutions and older games. Out of box settings are perfect didn't need much changes to the contrast and brightness. So, if you are considering getting one for a student/child it's quite perfect since they or you don't have to hassle about the contrast not being set right. It's also running at a great price as well. I compared this to one of my friend's Crossover S-IPS 27" 1440p monitor off eBay from Korea, which I loved but didn't want to take the risk purchasing from eBay, let alone a company that I know nothing about and I have to say I'm really impressed with BenQ's very capable monitor! The stand on this is substantially more feature rich, though isn't metal like the Crossover, the picture looks stunning on it. I don't do anything fancy with it, except game and use it for the real estate when doing school work, but it's so great just to look at! Definitely highly recommended for anyone who loves high res, great colour and a decent stand and is looking for a solid IPS to work with at 1440p. Pros: Tr�s bon prix lorsqu'en solde � 399.99$.Aucun dead ou stuck pixel :)Tr�s belle qualit� de construction.Grande surface qui permet quand m�me d'avoir du texte lisible.Tr�s bonne qualit� d'image et couleurs tr�s vivantes.Faible fuite du r�tro-�clairage.Panneau IPS.Couleurs 100% sRGB.Moniteur ajustable en hauteur, pivotable, rotation et angle du panneau.Tous les types de connecteurs.Cables HDMI, DisplayPort et VGA inclus.Base tr�s solide et stable.Aucun indicateur lumineux "power on" en fa�ade puisqu'il est localis� sur le cot� droit du moniteur.Boutons de menu physiques et non tactile accessibles sur le cot� droit du moniteur. Dimensions 21.80" x 25.20" x 9.60"